Thanksgiving in my family is always barely-controlled chaos. The whole family packs into the home that was passed from my grandparents to my aunt. Most years, there’s probably 20 adults, 10 kids or teens, and 3 to 5 dogs. Food, family, dogs, and kids. Oh, and because we’re from Wisconsin, Football. It’s quite the mix. Surviving Thanksgiving in my family doesn’t mean dodging political talk and avoiding snide comments about people’s health. It means managing a house full of dogs, kids, food, and adults who rarely mix otherwise. The thing is, if you’re reading this in mid-November, it’s too late to start training. So how do you survive? Some dogs are escape artists. Other dogs get a bit snarly when other dogs come near their food. In either case, baby gates are your friend. We use baby gates to ensure that my cousin’s pointer can’t make a break for it when the seven-year-old inevitably leaves a door open. Another baby gate lets my dad senior lab take a break from my cousin’s little Aussie mix (who wants to PLAY PLAY PLAY). That same baby gate keeps all the dogs from stealing food when we spread out on the floor to munch on snacks and watch football. Baby gates are your friend – and you can still get one before Thanksgiving day! 2. Give Your Dog Breaks. Not all dogs love all-day parties. I can relate. Most dogs will actually enjoy Thanksgiving more if you give them breaks during the day. Like toddlers, they might not choose to sleep on their own. And like toddlers, dogs sometimes “fuss” when we put them away for naps. But also like toddlers, dogs don’t always know what’s best for them sleep-wise. Bring a crate (or use the baby gates) to give your dog a 20-minute break every hour (or hour-long break every few hours). This can help reduce trigger stacking, the scary phenomenon where a dog gets more and more irritable throughout the day. Trigger stacking is one of the biggest reasons for unexpected dog bites! Give your dog something to do while she’s away from the action (see #4) for best results. Check out the video version of these tips below. 3. Give Instructions, Not Corrections. This goes for people and dogs. My own dog doesn’t like people in his face or other dogs near his food. Rather than trying to tell my family members that after they’re already getting growled at, I make sure to warn everyone ahead of time. Giving your family instructions on how to deal with your dog is less awkward (and more effective) than trying to fix things later. It also feels better for your family to hear instructions (and be reminded, if needed) than to hear a “rule” in a way that feels scolding. 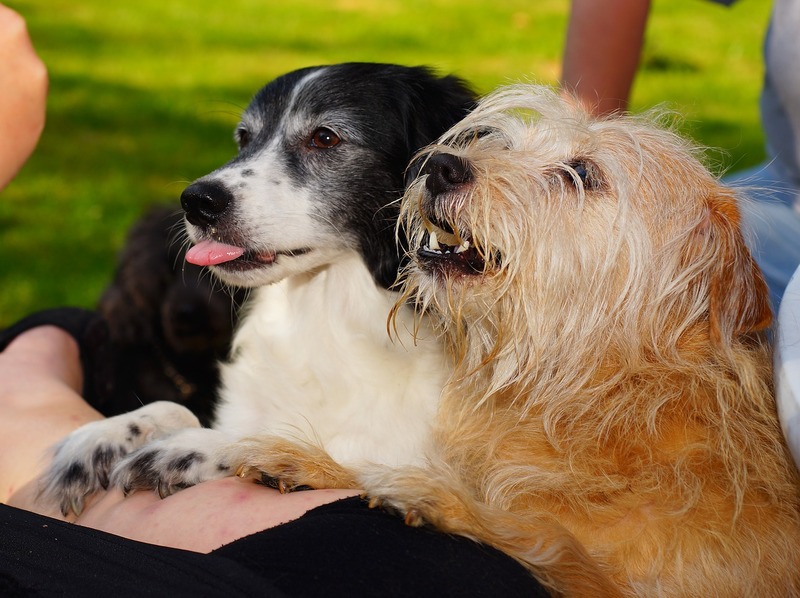 Give your guests one or two quick tips to guide them through working with your dogs. A sign on your door inviting guests to text rather than knock can reduce barking. Even though both interventions are polite, your family will appreciate the first one much better. 4. Give Your Dog Something to Do. A free-for-all with family, food, and (maybe) football is a lot for a dog to take in. When you put your dog away for her breaks, give her a puzzle toy (click the link to get a list of my 23 favorites) to keep her busy. Commanding your dog to listen to obedience commands isn’t likely to work well in such a distracting environment. Instead of trying to get your dog to sit-stay away from the table, use a crate or baby gate and occupy your dog with a tasty treat. Prepare a freezer full of tasty frozen treats for your dog before Thanksgiving Day. My favorite is to use wet dog food inside of Kongs, ice cube trays, and water buffalo horns. You can also put peanut butter on baking trays and freeze it! Frozen treats will keep your dog busy longer. 5. Watch the Kids and the Table. 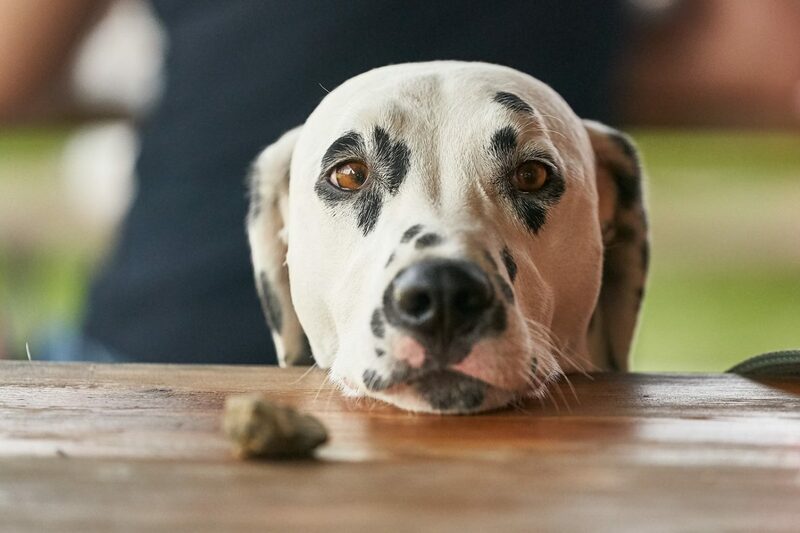 It’s no secret that most dogs will steal table scraps if given the chance. Your best bet is to use baby gates, tie-downs, and doors to keep that from happening. If you’re reading this just a few days before Thanksgiving, it’s too late for training! Kids and dogs don’t always mix. Take extra care to watch kids around dogs, especially if those dogs don’t normally live with those kids. Even if your dog normally loves his “kid siblings,” keep in mind that Thanksgiving is an extra-stressful time. Fluffy might be less patient than normal today. It’s better to be a party-pooper using a baby gate than to end the holiday with a hospital visit. If you can’t be watching your dog interacting with the kids (or the table), it’s time to separate the dog from the kid or table. Don’t forget lids for your trash cans! How do you survive a dog-friendly Thanksgiving? We’d love to hear your tips! I love your tip about telling people what TO do – it really works! I’m going to try some food puzzles this year, my dogs aren’t super outgoing and they deserve to enjoy the holiday without feeling pressured to interact with family members that they haven’t warmed up to yet. Let us know how it goes! Puzzle toys make almost everything better, in my experience! Are Dog Treats Bribery? Do Treats Make My Dog Beg or Only Listen When I’ve Got Food?